After a very sad and stressful week, I was able to attend the Stamp and Scrapbook Expo in Edison New Jersey last Thursday Friday and Saturday with my friend Jen. Oh my gosh, what fun we had!!! I came home with lots of bags full of crafty goodies. I still haven't had the time to unpack it all. Of course, my very favorite booth was the Heartfelt Creations booth with Andrea and Ben and Layla and Cayne. There was even a very special gift waiting for me there! I'm so very blessed to a be part of this awesome and amazing company! I'm back today with another pretty Christmas card with a little of the Merry and Bright Collection, the O Holy night Collection and the Sparkling Poinsettia Collection. 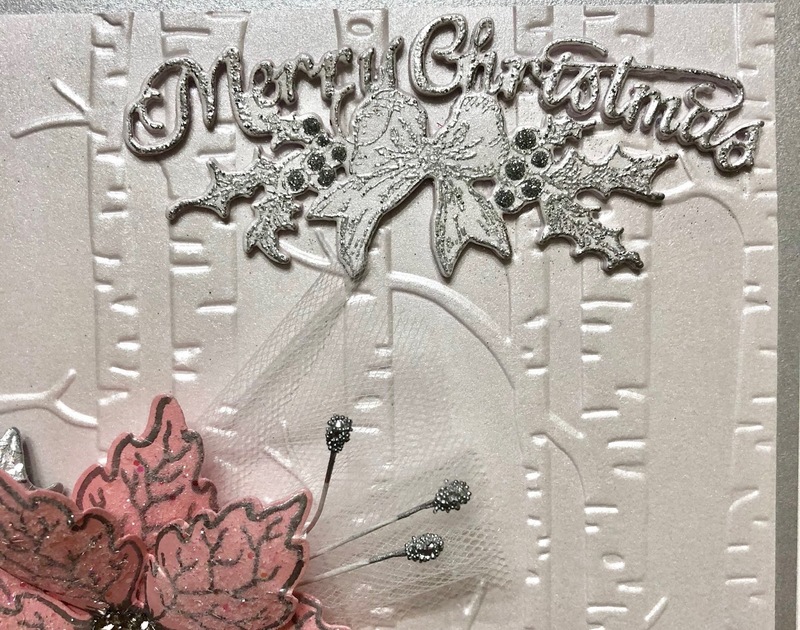 layer and adhere to the inside of the card using dries clear adhesive. 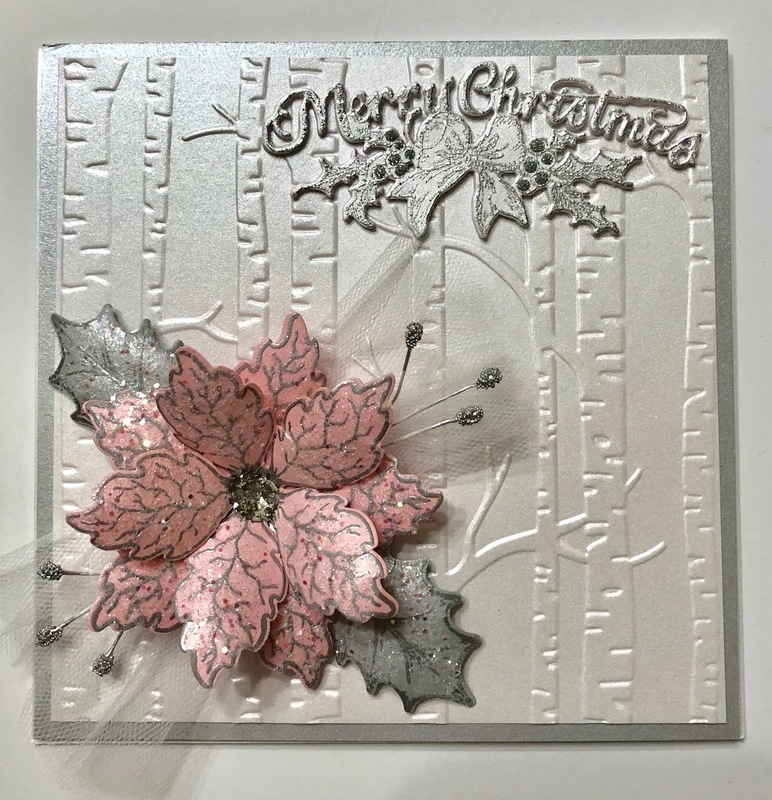 Stamp the Poinsettias on pink metallic cardstock using VersaMark, sprinkle with silver embossing powder and heat set using the Heat It Tool. Diecut using the coordinating die and shape using the Deluxe Flower Shaping Kit. Use two petals to create the flower. Add dries clear adhesive to the flower center and sprinkle with silver gala glitz. 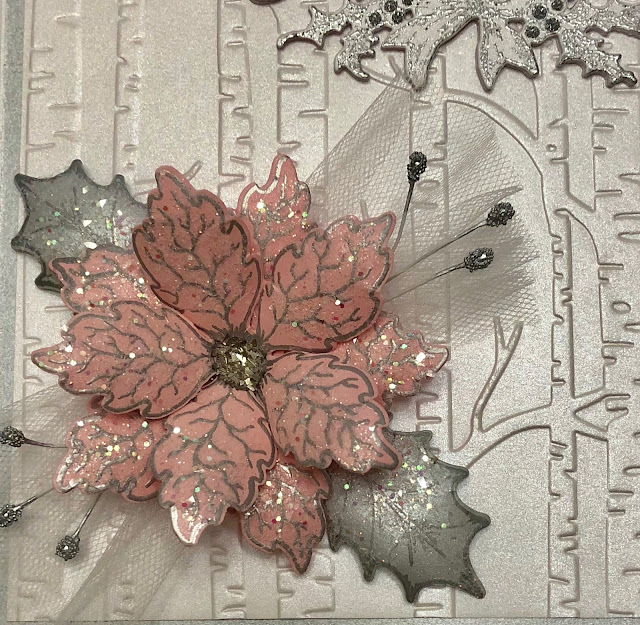 Stamp the poinsettia leaves on silver metallic cardstock using VersaMark, sprinkle with silver embossing powder and heat set using the Heat It Tool. Diecut using the coordinating die and shape using the Deluxe Flower Shaping Kit. Stamp the Merry Christmas Sentiment from the Silent Night Scroll Cling Stamp set on pearl metallic cardstock with VersaMark, sprinkle with WOW Metallic Silver Sparkle Embossing Glitter and heat set using the Heat It Tool. Diecut using the coordinating die and then diecut two more times. Adhere the layers together using dries clear adhesive and adhere to the card base as shown. Add some silver glitter to the berries. Be sure to stop by the heartfelt Creations Blog to see all of the gorgeous projects created by the amazing design team. Sponge the poinsettia and leaves with dries clear adhesive and sprinkle with Rajni Chawla’s Crystal Clear. Adhere the poinsettia, Leaves, tulle and stamens to the card base as shown using the hot glue gun. I'll be back next week with another Christmas project. Another beautiful and elegant Christmas card!! So pretty! I like the silver and pink combo! (Pink being my favorite color! I think you have inspired me to give this color combo a try!